Horse riding therapy is a good mental health therapy and we believe i helps our children. We would take the kids to Taman Tasik Titiwangsa where there horse therapy is carried out. 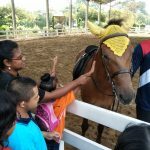 DBKl Horse riding team are also equipped with the knowledge on how to handle these special children and it has much helped the children. Horseback riding is also a form of therapy using trained horses and handlers for rehabilitation. Aside from strengthening the muscles and the spine, equine therapy (or horse therapy) helps improve balance and coordination, elevate concentration, reduce muscle cramps, and boost self-confidence, among others. It is suitable for those who have suffered a stroke and those suffering from cerebral palsy; down syndrome; ADHD (Attention Deficit and Hyperactivity Disorder), a mental disorder that is characterised by learning problems, among others.